Death's Door - Description | W. W. Norton & Company Ltd. Prominent critic, poet, and memoirist Sandra M. Gilbert explores our relationship to death though literature, history, poetry, and societal practices. 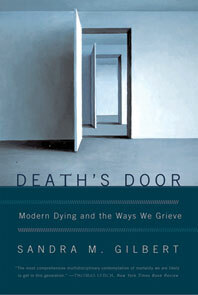 Does death change--and if it does, how has it changed in the last century? And how have our experiences and expressions of grief changed? Did the traumas of Hiroshima and the Holocaust transform our thinking about mortality? More recently, did the catastrophe of 9/11 alter our modes of mourning? And are there at the same time aspects of grief that barely change from age to age? Seneca wrote, "Anyone can stop a man's life but no one his death; a thousand doors open on to it." This inevitability has left varying marks on all human cultures. Exploring expressions of faith, burial customs, photographs, poems, and memoirs, acclaimed author Sandra M. Gilbert brings to the topic of death the critical skill that won her fame for The Madwoman in the Attic and other books, as she examines both the changelessness of grief and the changing customs that mark contemporary mourning. A career-spanning selection of the lucid, courageous and boldly political prose of National Book Award winner Adrienne Rich. A glorious survey of food writing from the classical world to the present. From the recipe novel to the celebrity chef, renowned scholar Sandra Gilbert explores the poetics and politics of food.